A step back in time, this classic American, family-owned cafe on South Grand Lake is serving good ol’ home-cooking, homemade pies and lots of friendly Southern hospitality. Since the early '60s, those in search of delicious Southern home-cooking on the south end of Grand Lake O’ the Cherokees have found their way to Langley and a no-frills cafe just a stone’s throw from the historic Pensacola Dam. The kind of place where diners instinctively know they’ll find a good meal for a good price, this classic American eatery has long featured traditional comfort foods, piping hot coffee and what has been voted as the best sweet tea on Grand Lake. From eggs cooked to order, delectable hash browns and fluffy pancakes fresh off the griddle to mouthwatering cheeseburgers with hand-cut French fries, hand-breaded chicken fried steaks and homemade pies, the cafe’s menu promises tasty comfort food. And the dishes being served never disappoint. For decades, Frosty & Edna’s Restaurant fed hungry Grand Lakers, becoming a South Grand Lake tradition. New owner Miquelyn Ailey is continuing that tradition of serving a good meal for a good price. Ailey purchased the restaurant in May 2018, changing the name to Ailey Cafe. 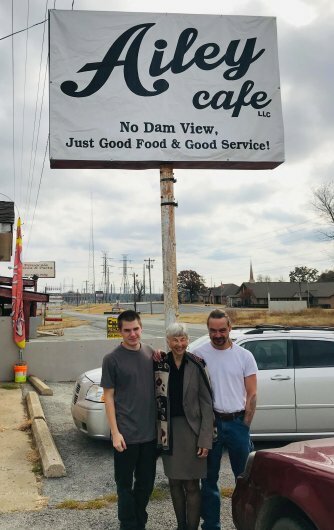 Her grandson, Jesse Ailey, is the cafe’s manager and cook. Several renovations have been completed on the cafe’s interior, including replacing the carpet with new flooring, adding a TV in the dining room and installing a new stove in the kitchen. The food at Ailey Cafe is good ol’ home-cooking with many dishes made from scratch following family recipes and using fresh ingredients. Everything on the breakfast menu at Ailey Cafe is cooked to order. The selection includes pancakes, French toast, biscuits and gravy, a variety of three-egg omelets, oatmeal and cereal. Sugar-free syrup is also available. Eggs are served with hash browns, toast and choice of meat, including bacon, sausage, country ham, ribeye steak and pork chops. According to Ailey, the country ham is a popular choice with customers. It is a generous cut that is nice and juicy. Breakfast is available all day at Ailey Cafe. Lunch starts “around 11 a.m. or when the mashed potatoes are ready,” Miquelyn Ailey said. The lunch menu has something for everyone and every appetite. The selection includes a variety of burgers and sandwiches, fresh salads, appetizers, steaks and dinners. Each burger is hand-pattied to fit the bun and are so big people’s eyes light up when they see them. Ailey Cafe has a good steak and chicken fried steaks, as well as a pretty good club sandwich, Ailey said. Lunch specials are also available. A customer favorite is the chicken and noodles with scratch-made noodles. Also popular at Ailey Cafe are the hand-cut French fries and the mashed potatoes, which are peeled and cut in-house as well. Like any classic American cafe, pie is always available at Ailey Cafe. The selection of pies varies but can include custard pie, meringue pies, pecan, a very rich chocolate pie and cherry cobbler, which is served with vanilla ice cream. There will also be sugar-free pies. Ailey liked that response so much, she made it Ailey Cafe’s motto. Ailey Cafe is open six days a week from 7 a.m. to 3 p.m. It is closed Tuesdays. The cafe is located at 13217 East Highway 28, in Langley, just minutes from the Pensacola Dam.